Loose and soft, easy fit over cloth for boys and girls. 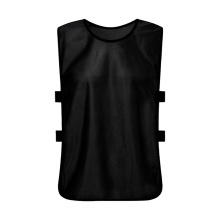 Both open side will ensure enough ventilation and absorbent fabric will keep you cool and comfortable during football, basketball and other sports practice. 6 pcs a set, suggested for teenagers of 45.2-57.0in in height. Cool and breathable: Both open side provide enough ventilation to keep you cool and comfortable during sports. Quick drying: Absorbent and washable, easy to clean and air dried. Loose and soft: Easy fit over cloth for boy and girls and allows a free and unrestricted movement. Superior fabric: Skin friendly polyester, bright but colorfast, quick distinguishable, easy identify your team, long-lasting for rough play. Designed for sports: Suitable for football, basketball, volleyball, hockey and other team training sports.